It was said to be a new kind of balloon race called a “point-to-point race”, the first ever held in the United States. Balloons were to take off from North Adams, Massachusetts, but the contestants were to predict ahead of time where they expected their balloon to land. The landing point had to be at least thirty miles form North Adams, and the one who landed closest to their designated target would be the winner. The race was held August 14, 1908, and the winner was Mr. Arthur D. Potter of Greenfield, Massachusetts, who piloted the balloon, North Adams No.1, which came down on a farm about five miles from its anticipated destination of Haydenville, a village in the town of Williamsburg, Mass. Accompanying him on the trip was A. Holland Forbes, and his 12-year-old daughter, Natalie. The following newspaper article appeared in The Morning Journal-Currier, (New Haven, Connecticut), August 6, 1908, page 4. New York, Aug. 5 – With a record of 25 successful balloon flights from North Adams, Mass., during the present season, and with many more booked for the near future with the certainty that they will continue up to the close of the ballooning season in October, the North Adams Aero Club will start on August 14 the first point to point balloon race ever held in the United States and the fourth race where more than two balloons are started that has ever been held in this country. At least four balloons and probably five, with a possibility of six, will be sent away during the afternoon, the pilot of each being required to name the landing place he selects prior to his departure. This place must be at least thirty miles from the starting point, and the pilot who lands nearest to the post office of the town or city he selects, providing he is within a ten-mile radius of the post office, will be awarded the trophy given by A. Holland Forbes of new York, a well known balloonist who has made the majority of his trips from this city and who is to be one of the contestants representing the United States in the international balloon races at Berlin, Germany, in October. This trophy is to be held by the winner subject to challenge after six months, and if the challenge is not accepted after thirty days the cup reverts to the North Adams Aero Club, which will arrange for a second race, as will be done immediately in the event that no one of the contestants succeeds in carrying out the provisions of the race on the first attempt. The balloons already entered are: Heart of the Berkshires, owned by the Aero Club of Pittsfield; pilot Alan R. Hawley, third vice-president of the Aero Club of America, and a contestant in the recent international race from St. Louis. Sky Pilot, owned by Mesers Wade and Morgan of Cleveland, Ohio: pilot J. H. Wade. Boston, owned by the Aero Club of New England; pilot, Charles J. Glidden of Boston. North Adams No 1, owned by the North Adams Aero Club; pilot, Arthur D. Potter of Greenfield, who will be accompanied by Mr. Forbes, the giver of the trophy. Greylock, owned and piloted by Dr. Roger M. Randall of North Adams. No restrictions as to the size of the balloons or the number of people each may carry is made, and each pilot, after witnessing the direction taken by several piloting balloons, is at liberty to pick his landing place, announcing it as he is ready to leave the grounds. 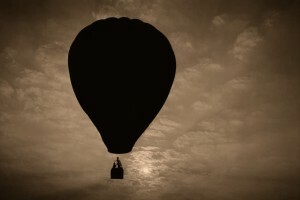 The first of the balloons will not be sent away until 1 o’clock at the earliest on Friday, August 14, and the others will follow at fifteen or thirty minutes intervals, as mey be determined upon the day of the race by the race committee. The following newspaper article appeared in The Marion Daily Mirror, (Marion, Ohio) on August 15, 1908, page 2. North Adams, Mass., Aug. 15 – The balloon North Adams No. 1, with A. D. Potter of Greenfield as pilot and Holland Forbes and daughter Natalie, aged 12 years, as passengers, and owned by the North Adams Aero Club, undoubtedly won the cup offered by Mr. Forbes in the first point-to-point race ever held in this country. The race was started from North Adams Friday afternoon. The North Adams No. 1 landed on the farm of Lyman Sanderson at West Whateley, about five miles from its previously declared destination, Haydenville. This was the first balloon to get away. The Greylock, owned and pilotd by Dr. Roger M. Randall of North Adams and having Clarence Wildman of this city as passenger, landed at Bryant farm in Ashfield, fully 12 miles from its desired destination, Leeds. The third balloon to start, the Heart of the Berkshires, owned by the Aero Club of Pittsfield, was the last to land, coming down in Amherst, within six and one-quarter miles of Whateley Station, its destination. The conditions of the race were that, previous to the race, the occupants of the balloon should designate some place, at least 30 miles from North Adams, where they would attempt to land, that they should land within ten miles of the post office of the place and that the balloon landing nearest the announced destination should win the cup. Further, the winner should hold himself open for six months to a challenge for the defense of the cup. Charles J. Glidden of Boston was to have made the fourth competitor with the balloon Boston, owned by the Aero Club of New England and having as a passenger Mrs. Helm Clayton, wife of the meteorologist of the Blue Hill Observatory. Mr. Glidden did not desire to start until late in the afternoon, but the committee on the race decided that the contestants must be ready to start at 1 o’clock. Mr. Glidden would not consent to go up at that time, so he was disqualified from competing.